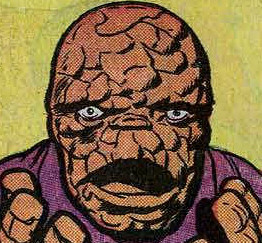 A turbulent year behind the scenes for The Fantastic Four, as during the middle of writing the six-part “Authoritative Action” storyline Mark Waid found he was fired. As has often been noted with previous behind-the-scenes disputes and wranglings, the full story may never be truly known, with many conflicting and contrasting reports. Waid himself stated that the FF editor, Tom Breevort, was given a replacement script for the March 2004 issue (#509) written by the then-President, Bill Jamas. In contrast to this, Breevort stated that although Jamas was intent on removing Waid from the book (possibly encouraged by the fact that the loss-leading 9c issue hadn’t greatly increased sales) there was only a two-page outline, no script. Mike Wieringo, on the other hand, recalled being offered a script to work on after Mark was fired, and declined to continue work on the FF without Mark due to the quality of the replacement script. To further complicate matters, Roberto Aguirre-Sacasa recalled that his proposed work on a stand alone mini-series (FF: Working Class Heroes) was suddenly pulled to be the storyline for the regular book. (In the event, it got turned into the Marvel Knights: 4 series). For the record, Jamas’s vision for the comic was purportedly that it should feature more comedy and suburban elements, such as Sue working as a secretary and the Fantastic Four living in a regular neighbourhood(!) In the event, Jamas moved to a different position in the company and Waid was reinstated without any gap in between his 36-issue run. In terms of the issues, then Waid concluded the “Sentient” story from the previous year, and followed it up with an inconsequential light-hearted romp. Just when it seemed as if the Waid era wouldn’t contain anything of substance, the writer gave us one of the finest Fantastic Four stories of all time: a thirteen-part magnum opus featuring possibly the ultimate Doctor Doom battle and its consequences. Wieringo’s artistic style can probably best be summed up with the prologue to the “Unthinkable” arc, “Under Her Skin” (#67), only the second issue after #258 to not feature a single member of the Fantastic Four. Like the 1983 Byrne issue, it’s also one given over to Doctor Doom. Doom is reimagined as even more ruthless than ever before, burning his first love in flames and using her rotting flesh as new armour… yet in Wieringo’s hands it almost resembles the work of Disney. The “Unthinkable” arc contained truly disturbing scenes of torture, with Ben having his teeth continually knocked out, and Johnny having his skin torn, Hellraiser style, by hooks. However, Waid acknowledged that Wieringo’s style helped to “balance” the book, keeping it a PSR rating. The artist himself conceded that his style was “a little too cartoony and light”, though his breath of vision (including designing a library with near infinite bookcases) is admirable. As noted from the storyline descriptions above, Doctor Doom’s evolution as a character is also perilously close to Waid’s habit of completely redrafting characters beyond prior recognition. Mark’s tendency to overstate family emotions also grates at times, as does the tendency of characters to joke about situations where it’s inappropriate (such as Sue laughing with Reed that Franklin’s possession was the result of magic, or Johnny wisecracking while trying to rescue his nephew from Hell itself). There’s also the small matter of plot concepts being oversold – Reed’s faith in science over magic throughout the “Unthinkable” arc is a good, solid concept for a story, but spelt out to the reader so many times it borders on patronage. Most of the arc should gain full marks, but they’re kept back by such occasionally corny lines as “The realm of the supernatural is a vast tapestry. But you see yourself as the needle and the thread.” Biggest offender was #502, which included the worst example of saccharine platitudes the book ever had. Yet ultimately the title felt vital again, and – even with the resurrection of Doom – felt like it had new places to go, rather than retreading the past. With Mike Wieringo’s workload unable to accommodate all the issues of the year, then the artist produced just half. The guest artists who seemed to make a conscious effort to ape his style were: Mark Buckingham (#65-#66), Casey Jones (#501-#502) and Howard Porter (#503-#505), all with various inkers. All of the Wieringo issues were inked by Karl Kesel, save for #70, which had Lary Stucker on duty. By this stage of the comic, it looked visually better than ever – a world away from the white borders of a bygone era, every page is filled with colour, often having no trace of plain background, with Paul Mount doing a tremendous job on high-quality paper. Far away from the rough, muddy-looking stuff they were using during the late 70s and early Bryne era, this is a glossy, well-made product. Even if Wieringo’s art is an acquired taste, his sense of depth and panel composition is pretty much first-rate, my only complaint being that Dr. Strange looks exactly like Reed, save for a ‘70s-style pimp moustache. To add to this, from #71 (or #500) onwards the original numbering took precedence in the cover panels, with the third volume numbering being dropped altogether (as well as a return to the original logo) from 2004’s #509 onwards. On a strange note, then with Wieringo illustrating ten covers throughout the year (he also did some of his first work on the title with covers for Vol.3, #51-#54 after doing the interior art for the last issue of Vol. 2) then it’s curious that virtually none of his covers bear any relation towards the contents inside, and instead are largely generic poses with the four members of the group. This phenomenon isn't solely related to Wieringo either, as the covers the following year by Gene Ha saw the Frightful Four fail to feature on any of their respective covers, seemingly flying in the face of what a cover is for, ie. to sell the issue. The two-part bridge between “Unthinkable” and “Authoritative Action” contained one of the biggest continuity blunders in the title, as stand-in artist Jones drew Johnny with a cast on his arm, rather than on his leg, as well as a terribly clichéd “if you could go back in time…” storyline. As part of the thirteen-issue Doom arc, it’s the weak link, though has its merits. Authoritative Action itself was planned as a bi-monthly release, with Marvel adding a thirteenth issue per year to titles in place of Annuals. Realising that the sale figures still held up despite the issue increase, Tom Breevort decided to up this further to eighteen, with the six-part storyline being released over three months. In the event, the temporary sacking of Waid put paid to these plans, and the issues were released as normal. A superb storyline that and the Fantastic Four invading the land in order to ensure Doom’s weapons of mass destruction don’t fall into the wrong hands. Porter’s art was, if perhaps not as well composed in terms of panel layout, more naturalistic than Wieringo’s. There’s also amusing lines of dialogue like Ben asking Reed if he can put more exposition in a sentence, or Ben’s curious monkey dreams. The only real flaw with the six-part cycle is that the covers drawn by Tony Harris in Wieringo’s total absence are weak and again have absolutely no bearing whatsoever on the stories they allege to promote. A previous version of this article did erroneously state that the story gave us "for the first time", a "specific location of the fictitious Latveria (off the Southern border of Hungary, which would put it in the Serbia/Croatia district)". This actually contradicts the second FF annual from 1964, which put Latveria in the Bavarian Alps of Southeast Germany, a good 400 mile difference in location. On a personal note, the six-issue “Authoritative Action” storyline was where I came in. Having fallen away from the title with the DeFalco-Ryan era (can you blame me?) and being even more distanced by the notion of a 35-year-old history being rekickstarted with two further volumes, I was enticed back with the buzz around the Waid run and bought the trade paperback of the issues. Not only did it impress me enough to carry on reading the book again and also go back and collect what I’d missed, but its obvious parallels with the occupation of Iraq in 2004 finally cemented an idea I’d had in my head for some time: a site that looked at the social history of the Fantastic Four, through war, race riots, Presidential administrations, the emergence of feminism and the dawn of political correctness. In the end result, despite what I say in this site’s introduction, I was on the wrong track: Waid claimed that “there was talk of military action in Afghanistan and Iraq but a lot of people didn’t take it seriously.” His plot was inspired by the consequences of heroes following up their actions rather than any real-life incidents which hadn’t actually taken place when he wrote the story, but which were big news by the time it came out. Like Stan and Jack before him with the Black Panther, it appears that Waid’s “Authoritative Action” was fortuitous rather than designed. That said, obvious parallels are factored into the script: #504 has Reed using term “Weapons of Mass Destruction”, while #505 sees him tell Nick Fury “this isn’t Iraq.” Whether these additions were added nearer the publish date or whether the official line that the story wasn’t strictly based on the US occupation of Iraq isn’t quite true is perhaps another of the conflicting behind-the-scenes stories that will become clearer in time. Finally, a point of trivia is that Johnny notes he got a “C” in High School Spanish “seven, eight years back” (#502), further cementing the notion that the entire run of the title has taken place in less than a decade, and placing Johnny in his mid-twenties. 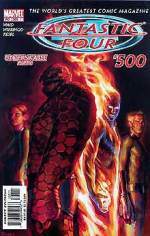 Lastly, the 500th issue came in an alternate "Director's Cut" format, with Waid and Wieringo discussing how they put the issues together, as well as a covers gallery, Stan's first synopsis for the FF and a special anniversary cartoon by the wonderful Fred Hembeck.